Poke Radar APK has been released so we can download the latest version 1.6 for Android. Basically, finding Pokemon is not easy, that is why you have to have a trick to be able to help you in finding the existence of the monster. Currently, there are many kinds of maps that can be installed on your smartphone for free to help your hunt to catch the Pokemon. And we tried a few tools and suggest you, the pokemon game players, to try an application called Pokeradar. This app can be access through the website and it can be installed on your smartphone for free and easy to use. If you have downloaded the app and install it to your phone, you simply open the app then you can tap the arrow in the bottom right corner, then map will be larger. 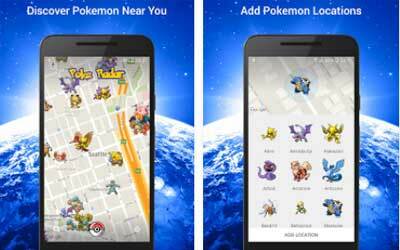 In this way you will be able to see where the location of Pokemon. However, this application is an application created by some Pokemon Go player community, then maybe you’ll get wrong or fake location. Because the information provided may not be true. However, the fake or wrong location can be known by users, we can see the downvote values given by other users, so you should see the downvote value before you go to that place. If there are high downvote on a location, it will be deleted. Poke Radar can also track the discovery of pokemon in that location at the time of the day or night. It will be easier for you to determine where a particular location and Pokemon type that will appear at certain times only. The app is good, showing where some Pokemon and giving a chance for others to find them. The downvote help me to avoid fake information. Beautiful application, beautiful UI. Really hoping people will use this app. I can’t wait to go hunting!